literature, and optimally tailor evidence-based medicine for each patient. 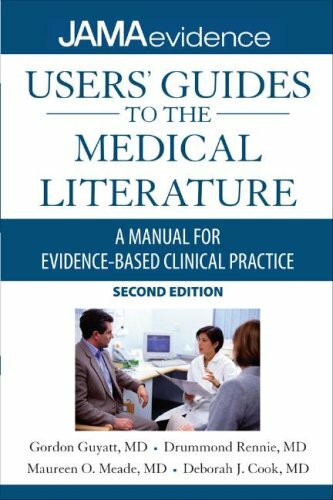 The new second edition of this landmark resource is now completely revised and refreshed throughout, with expanded coverage of both basic and advanced issues in using evidence-based medicine in clinical practice. FEATURES Completely revised and updated to reflect the enormous expansion in medical research and evidence-based resources since the first edition Innovative organization guides you from the fundamentals of using the medical literature to the more advanced strategies and skills for use in every day patient care situations Abundant and current real-world examples drawn from the medical literature are woven throughout, and include important related principles and pitfalls in using medical literature in patient care decisions Practical focus on the key issues in evidence-based practice: What are the results? Are the results valid? How to I apply to results to the care of my patients? Edited by over 60internationally recognized editors and contributors from the U.S., Canada, South America, Europe, and Asia-the best of the best in the discipline NEW, Current, authoritative content covering how to: Avoid being misled by biased presentations of research findings; Interpret the significance of clinical trials that are discontinued early; Influence clinician behavior to improve patient care; Apply key strategies for teaching evidence-based medicine; And more Also look for JAMAevidence.com, a new interactive database for the best practice of evidence based medicine. Gordon Guyatt, MD, Deputy Editor, JAMA; Professor of Medicine, McMaster University, Hamilton, Ontario, Canada. Drummond Rennie, MD, Professor of Medicine, UCSF School of Medicine, San Francisco, CA Maureen Meade, MD, Department of Medicine, McMaster University, Hamilton, Ontario, Canada. Deborah Cook, MD, Department of Medicine, McMaster University, Hamilton, Ontario, Canada.